Caroline, was a talented musician even as a teen-ager but after a compliment she would always say, "Thank you, but "I play well only because of my teacher, you should hear her, she plays like the touch of angel wings on the strings." She was referring to Katherine who was not only her teacher, an exceptional violinist, but also a very kind, generous, elect lady who not only taught her music but many good things about life. After Katherine's death it was very hard for Caroline to put her heart into her playing. She and her parents were at a loss as to where they could possibly find another teacher. After several weeks went by they were surprised by a phone call from, Jason, the son of this beloved teacher. He quietly said, "If you ever feel like you could drive, once a week, the 3 hours, to where I live, I would like to have Caroline as my student and try to take up where my mother left off - I think she would like that." Needless to say they gave little thought to the drive. The important things was to begin lessons again and to have lessons from this extraordinary young man, who was already a member of a well known symphony orchestra, seemed like a God-send. 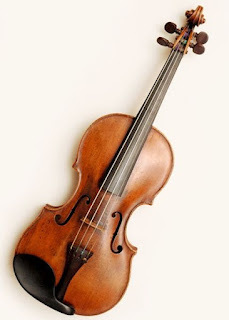 The young student had let her violin lay in its case for several weeks but now music filled their home. She realized she had much practicing ahead to make up for those weeks of letting the violin lay idle. Saturday morning came almost to quickly and anticipation turned to apprehension. As they turned on the street where the new teacher lived, Caroline turned to her mother and said, "Mom, I don't think he will teach me very long." "Oh, I don't mind waiting an hour, it will be worth it," Joanna, her mother replied. "No, I don't mean that, I mean he will listen to me and say, "Caroline, get a life! I don't have time for you, I can tell you haven't been practicing." Joanna, offered the needed encouragement and Caroline slowly walked up the sidewalk to the front door. It took only a few minutes of visiting for Caroline to became comfortable with the new teacher. Jason reminded her so much of his mother. For the next 15 minutes he instructed her to play certain pieces for him and then suggested a rest. Caroline knew she had not played as she had done in the past and the apprehension returned. Jason, picked up her violin and looked at it and then at her as he said, "You are a good violinist, Caroline but you can become a great violinist, it is your choice, if you will remember one thing, "Don't practice your mistakes." For a moment she looked at him with surprise and wonder, he wasn't reprimanding her; he was instructing and encouraging her just as his mother had. "Oh, alright, I won't - not ever again," she quickly replied. Jason smiled; he could remember those years when he was her age and that same lesson his mother had taught him. "Don't practice your mistakes." Those words had been a great influence in every phase of his life, as well as the reminder, "It is your choice." After Caroline left, he sat a few minutes alone in the music room. His wife wondering why he hadn't come into to lunch went in search of him. He smiled as she came through the door, "My, sweet I don't think it will be long until we hear violin music that will sound like the whisper of angel wings on the strings." "How did it go," Joanna asked when Caroline got into the car. "Mother, I know this sounds strange, but it felt just like Katherine was there as Jason talked with me, I'll bet if she were still alive she would have said just what Jason said as I left, "Drive carefully and don't forget Caroline, don't practice your mistakes." Joanna reached over and gave her daughter a warm hug. Dear Lord we pray today that we would not practice our mistakes. Help us do the very best in all that we do. In Jesus’ name, Amen.